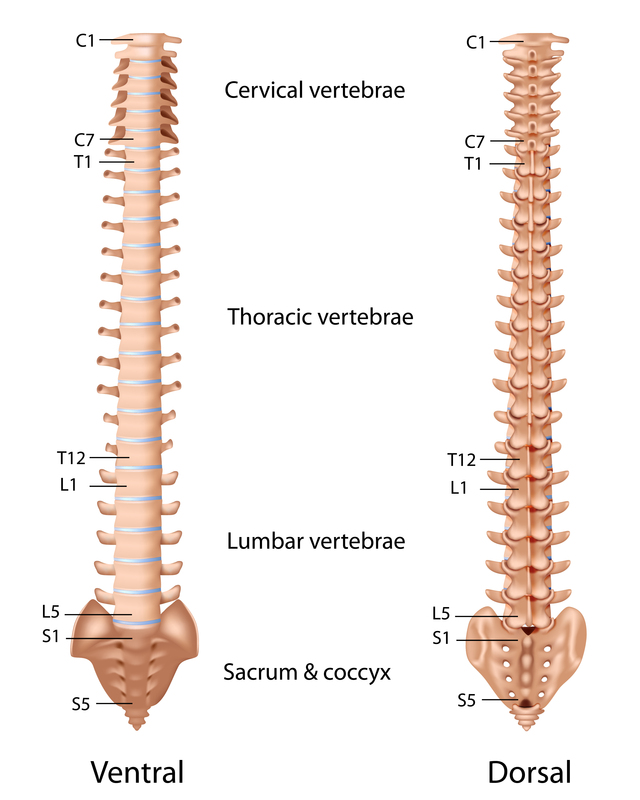 The vertebral column is the central axis of the body, acting as a support. It is a kind of flexible and solid 'armor' to protect the delicate nerve structures from damage. The vertebral column consists of 33-34 odd, symmetrically constructed vertebrae. The following segments of the spine can be distinguished : cervical, thoracic, lumbar and sacro-coccygeal spine. The thoracic vertebrae are larger and more strongly constructed than the cervical ones; the lumbar vertebrae are marked by a more massive construction and larger size than thoracic ones, whereas the sacral vertebrae are fused together to form one bone called the sacrum, whose major task is to carry the torso and the whole body weight. ​Thoracic vertebrae - they are larger and more strongly constructed than the neck. It should be noted that these vertebra have joint surfaces with which they connect with the ribs. This provides greater stability of the entire thoracic. Moreover, the vertebral bodies have a wedge shape, the lower they are, the greater it is. The front part is significantly lower than the back part which forms a natural curvature of the thoracic - kyphosis section. A very characteristic feature of these vertebra is the shape of the spinous process at the end, which is long, not split in two and directed downward. This is an important feature, thank to which the protuberances of the successive vertebra overlap like roof tiles. Cross- they fuse into one sacrum, which fulfills the task of carrying the weight of the trunk. It is located between two pelvis bones - together they form the pelvis. 3-5 fused vertebra have a wedge shape directed downwards. The extension is performed passively by the ligaments flavum and actively by extensor muscle group (Musculus erector) ; the abdominal muscles serve as the flexor. The lateral flexion of the spine (side bending) is performed by ventral and dorsal muscle bands of the one side. The movements of rotation are performed by the muscle spirals, which include back and abdominal muscles on both sides. The spine is exceptional part of the body, 'Nature' as an architect in this role is second to none! Each vertebra has its function, and each section of the vertebrae is a connected structure, thanks to which for example we can stand. Let's consider the fact that the articular surfaces combine twenty-three intervertebral discs. The spine is not a rigid and solid armor, but a multi-part armor, so its elasticity increases significantly. Due to the properties of intervertebral discs, all shocks are eliminated or at least reduced considerably. The curvatures of the spine also protect the central nervous system from shocks (so called ‘shock absorption’). When does the spine set in? The most common cause of spinal diseases is an incorrect lifestyle. The modern man spends many hours sitting, but does not think about whether he is doing it properly. Just as often, doing heavy work, he lifts weights improperly or does not care about a comfortable place to sleep. As a result, after years of such proceedings, it turns out that we suffer various afflictions of all segments of the spine. It is sufficient to just change a little so that the backbone serves us for a long time. Degenerative disease of the spine - is a premature wear and degeneration of the tissues comprising the functional connection of the vertebrae - that is, the disc with the facet joints. It mostly affects elderly people, but can also develop in young age too. A medical history of back injury, professional sports, spine deformities is a predictive factor in its occurrence - it particularly refers to scoliosis and some hormonal and metabolic disorders. Sciatica - it is manifested by the acute pain in the back area, radiating to the buttocks, and even to the feet. Patients affected with sciatica are sometimes excluded from normal life for weeks since the pain can be so strong and nagging that it is impossible to function normally and move without help. erniated disc -it is a broad term that describes the disease process where different types and degrees of damage to the annulus fibrosus cause abnormal movements of the inside of the disc mostly to the posterior lateral direction, leading to the annulus fibrosus overload. The degree of bulging and damage to the annulus fibrosus and nucleus pulposus is assessed by performing the magnetic resonance imaging examination. An accentuated disk most often constricts the nerve roots, causing radicular pain, back longitudinal ligament and dural sac. The pain felt during the oppression of the herniated disk at the root core is very strong and runs along the limbs reaching even to the fingers. How to take care of the spine? The simplest form of prevention for everyone starts from an early age and it is simply gymnastics - in kindergarten or physical education classes at school. When this fails, you have to go one step further - that is change your daily habits, and as we know, a Pole is wise after the damage has been done, it's hard to be convinced to effort. But the devil's not so black as he is painted. The spine needs movement. In order to sustain the whole structure, you must have strong back muscles, which cannot be done on its own. You have to work on them. Swimming, aerobics or yoga are appropriate activities that will help us in this. The spine should be straight - so just stop slouching. With help come furniture manufacturers who are already constructing such seats, chairs and beds that help relax tense muscles and provide proper posture while working, e.g. in front of the computer. Do not unnecessarily load the spine. When you need to carry something heavy, try to do it in a correct position. Spread the weight evenly, e.g. when doing shopping, carry everything in two bags in both hands. When ducking bend your knees rather than the spine. The spine is nevertheless delicate and when you forget about it, you are not improving, but worsening its condition.